I was sitting next to this guy in Sunday School, at church. I'd seen him a time or two, but hadn't introduced myself yet. So, today, I did. We chatted briefly, but not much. He mentioned that he was looking for work (who isn't these days). I asked him what kind of work he was looking for, he said he'd recently applied at a new restaurant that was opening up here in a few weeks near our town. We got to talking about that, and he told me about going to culinary school and getting his baker's cerification, and all sorts of things like that. Of course, that had my attention. So we sat there talking right up until the lesson started. Then we talked more afterward. Then I invited him over while I cooked tonight's dinner. He came over, and brought some incredible cookies that I'm going to have to share here sometime. He also promised to have me over the next time he and his family made tamales. Anyway, so, we hung out and cooked. It was sooo fun just to have someone to chat with while cooking. He also helped move some furniture with me, but that's another story. I had planned on doing hot wings, so I carried on with that intention. I had researched a lot of different recipes for the sauce, and in the end, like I usually do, I created a hybrid. I also took a twist on the technique, too. about 2 dozen chicken wings, thawed. I started the whole adventure today by lighting up some coals. Quite a few, actually. While those were going, I went inside and cut up the chicken. The wing tips, of course, I threw away, and the other wing parts I separated and put into a bowl. By the time that was done, the coals were getting ready, so I put one 12" on, and poured in about a quarter inch of oil. I let that heat up on about 20 or so coals. While that was heating up, I pureed the chipotle chilis, and added everything else (except the flour) to my 8" dutch oven. I put that on about 8 coals. I added about half of the chicken wings to the oil, and started them frying. I fried them with the lid on, but no heat on the lid. I fried them until the chicken looked done. I could have let them go longer, just to crisp up more, but in the end they crisped up just fine. More on that in a minute. I turned them once, and when they were done I pulled them out into a bowl, and put in the other half. I wondered what it would have been like had I dredged the wing pieces in flour before frying them. Hmmmm... Another thing to try! Meanwhile, the sauce was simmering nicely. The butter'd melted, but it was looking really thin, and it wasn't blending up nice. 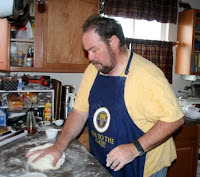 I added the flour a sprinkle at a time, and that thickened it, and it also allowed the liquids to bond together better. In retrospect, the next time I do this, I'm going to melt the butter first and make a roux with the flour, then add the other ingredients. I wasn't sure how it was going to taste, so I kinda went easy on the chilis. I think next time, I won't be so afraid. It didn't turn out hot at all, even though it was a good spicy flavor. Anyway. I'm getting ahead of myself. While the chicken and the sauce were cooking, I also made sure that I had a big supply of fresh coals ready, because that was going to be necessary for my next step. Once all the chicken was done, I put them all into a bowl and poured the sauce over the pieces. I stirred it up and made sure they were all coated. Now, for the final step. It would have been pretty easy to pour off the oil in the first dutch oven, but I had another 12" handy, so I just used it. It seemed quicker at the time. I put that on a lot of coals. There were still quite a few left burning from the frying, which I arranged in a circle, and then I added a good 5-10 more from the fresh coals. Then I put the chicken, coated, into the dutch oven, and then put the metal grill on top. Finally I added the lid on top of the grill, with about 20 more coals or so on top. I was all set for my dry roasting technique. The idea was that I had all these great chicken wings coated with this sloppy sauce, and I wanted to bake that on like a glaze. If I'd just put the lid on, it would have trapped the moisture, and it wouldn't have glazed right. So, I up the heat, and put that metal grill to lift the lid slightly. That lets the moisture escape! In about 10 mintues, I went to check on them. I turned the pieces, and with my brush, basted them in more sauce. In about another 10 - 15 minutes, they were nice and crisp and the glaze was baked on. We served them up with blue cheese dressing. And they were goooood. Again, like I said, I shoulda upped the chili powder a bit. It all comes to knowing just how hot your chilis and your chili powders are. And I don't know that yet. So, here's to new friends and new recipes!